Ryanair is well known for the cheapness of its flights. But its shares are expensive and that remains true even after a 12 percent dive on Nov. 4. The blow came as Europe’s largest no-frills airline served up its second profit warning in two months. Ryanair now expects net profit for the current year to fall by about 10 percent. Ryanair has discovered the limitations of its long-standing strategy to offer ultra-cheap flights to airports in secondary or even tertiary locations. It blames Europe’s economic woes, the good weather in northern Europe and currency movements. But it is clear that rivals like easyJet and Germanwings, which are serving first-tier airports at marginally higher prices, are providing stiffer competition. Ryanair’s heavy-handed approach to customer service, which passengers have long tolerated as the price of a bargain, appears to be more off-putting. Moreover, unlike easyJet – its close rival that recently raised profit hopes – Ryanair is struggling to find appeal among business travellers. In the context of its emerging difficulties, it is hard to see why Ryanair shares deserve to trade on a premium rating. It foresees stagnating traffic growth in the next 12 months and says it will rely on “aggressive seat sales to stimulate traffic.” It might achieve some earnings growth in the financial year starting in April 2014, but previous hopes that it would grow 20 percent look like a pipe dream. Realistically, the best shareholders can hope for is that Ryanair will report earnings next year that are the same as in 2012. Even including pending share buybacks, this implies an above-industry average price-to-earnings multiple of 12. It would be wrong to write off Ryanair. Its strong balance sheet and outstanding earnings track record suggest that it may bounce back. But confidence is leeching fast. Before buying, bargain hunters will need more reassurance that Ryanair is adapting to changing consumer tastes, or that its ultra-cheap strategy can find renewed popularity. Since early July, Europe’s biggest low-cost airline has lost 28 percent of its market value. Stability may return most quickly if the company prunes its growth ambitions and focuses more on sustainable profit. 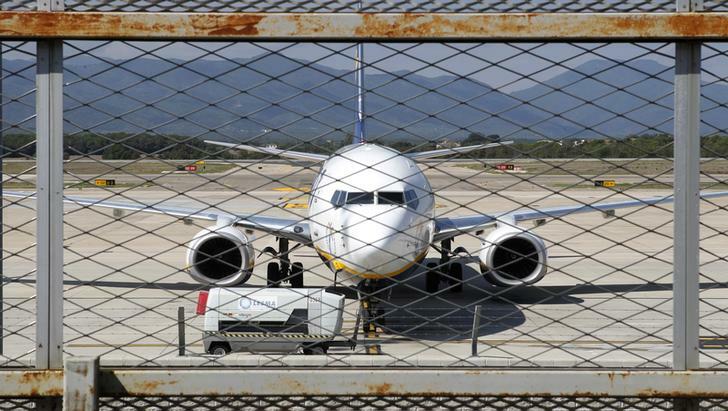 A Ryanair plane is seen parked through a fence at Girona airport. Ryanair lowered profit expectations for its current year by about 10 percent on Nov. 4. It now expects after-tax profit of 500 to 520 million euros instead of 570 to 600 million indicated earlier. It also said it expects stagnating traffic growth during the coming 12 months, ending a 20-year period of rapid growth rates. The profit warning is the second within two months. The Dublin-based carrier had already lowered its traffic and earnings guidance on Sept. 4. In the six months to Sept. 30, 49 million passengers flew with Ryanair, 2 percent more than a year earlier. Average fares were 2 percent lower. However, the airline did see a 22 percent increase in ancillary revenue from reserved seating, priority boarding and credit-card transactions. Total revenue in the first half increased by 5 percent to 3.3 billion euros. After-tax profit rose 1 percent to 602 million euros. Shares of Europe’s largest airline by market capitalisation fell by 12 percent by 1300 GMT on Nov. 4.